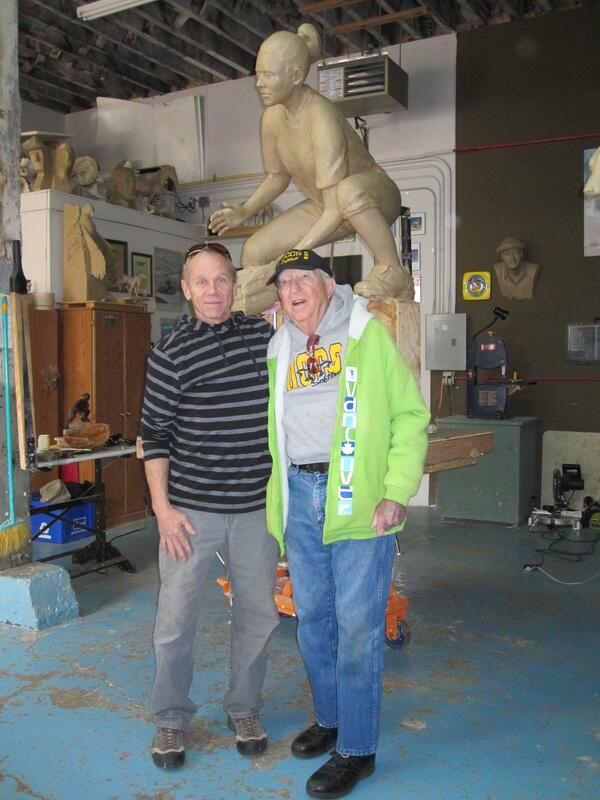 Sculptor Denny Haskew, left, and UCCS supporter Glenn Williams stand before a clay rendition of woman softball player that will be used to complete a bronze sculpture. UCCS supporter Glenn Williams aims to level the playing field with several gifts he has made toward UCCS women’s athletics these past five years—including an endowed scholarship for women athletes. And now, with a gift of a 12-foot-high sculpture that will grace the Four Diamonds Complex on North Nevada Avenue, Williams’s legacy will be evident not only to his scholarship recipients, but to thousands who use these athletic fields each year. Williams commissioned Loveland sculptor Denny Haskew and the National Sculptors’ Guild to produce this $155,000 bronze sculpture, which will feature a woman shortstop modeled on a former UCCS player. The sculpture, whose commission was facilitated by the CU Foundation, will be installed and unveiled at a ceremony at Four Diamonds in spring 2011. Haskew’s work, heavily influenced by his own experience as a Native American, is showcased in many high-profile municipal settings as well as in major collections and museums including the Smithsonian Institution in Washington, D.C.
“My inspiration for this sculpture has been to create a museum-quality monument that reflects the intense focus of the student-athlete and has the appeal and respect of the UCCS community,” Haskew said. 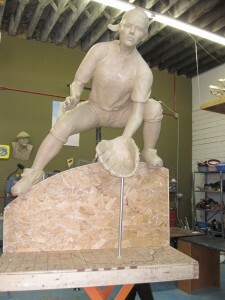 A clay rendition of a sculpture of a woman softball player that will be placed at Four Diamonds. Williams has similarly donated athletic sculpture to schools such as Eastern Illinois University—where he spent his career as a high-ranking academic administrator. The Glenn D. and Joan R. Williams Endowment for Women’s Athletics, established in 2007, has already supported UCCS women student/athletes in softball, basketball, and volleyball; he has endowed another fund to support the softball coach position. His gifts to UCCS are all the more remarkable given that his association with the university began in 1993 when he attended his first UCCS softball game. In 2005, he met softball coach Scott Peterson while attending a UCCS playoff game, and became an enthusiastic supporter thereafter. Williams credits Shockley-Zalabak’s performance as chancellor as another primary reason for his support of UCCS: “She has done everything right, and I know what it looks like on that side of the desk having been a college administrator,” Williams says. Williams feels strongly about supporting women’s sports at UCCS. “The least amount of scholarship money is awarded to softball—every other sport gets more than we do. And one of my priorities is to level the playing field,” he says.